As a Council Member, Margaret currently serves as Chair of the Pasadena Municipal Services Committee, responsible for directing city policy in the vital areas of water and power. Margaret is committed to advancing the city as an environmental leader while providing affordable power and water for our residents for years to come through solid planning and infrastructure investment. 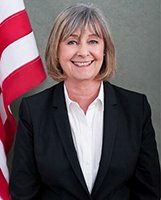 Margaret also serves on the Finance Committee, is the Pasadena representative to the Foothill Transit Joint Powers Authority, the Arroyo Verdugo Subregion Steering Committee and serves on the Housing, Community & Economic Development Committee of the League of California Cities. The hallmark of her service is her championship of quality of life issues, including promoting a safe, secure city, preserving and acquiring open space, parks and affordable housing, and protecting the character of our residential neighborhoods, which are so vital to Pasadena’s success. Margaret began her 30 years of civic involvement as a neighborhood activist and continues to support, encourage and develop neighborhood leaders and neighborhood involvement through authentic community participation in city government. She served as Pasadena City Planning Commissioner from 1993-1997 and was appointed again to the Planning Commission in 2005 by Mayor Bill Bogaard. She served as a member of the City’s l998 Charter Reform Task Force. Committed to community service, Margaret served as co-president of the Historic Highlands Neighborhood Association and was a founding member of both the Victory Rose and the Washington Square Neighborhood Associations. In her 25-year career as an asset manager for a privately-held real estate management company, Margaret acquired extensive experience in managing multi-million dollar projects and budgets, municipal bond financing, litigation oversight, project management and acquisitions and sales. She holds a Bachelor of Arts degree in Business Administration from California State University, Los Angeles. Margaret fell in love with the city and its neighborhoods after moving to Pasadena more than 30 years ago. She lives with her husband, John, and their superdog, Wrigley, in the Historic Highlands neighborhood.